The hits keep on coming from Greg Ginn‘s version of Black Flag. 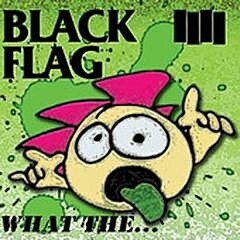 Shortly after losing his lawsuit against his former bandmates, Ginn has unveiled the title, album art, and track listing of Black Flag’s new album (seen above) via iTunes, and…well, look at the thing. I’m not even sure what to say about it, other than that William Shatner’s graphic designer apparently isn’t on an exclusive retainer. The album will be called What The…. I concur.